You are invited to a night of family fun at National Night Out! 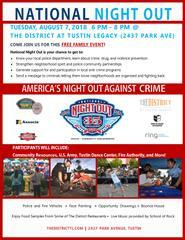 The Tustin Police Department will participate in the 35th Annual National Night Out. You and your family are invited to attend and help take a stand against crime. It is about crime prevention and interacting with law enforcement personnel in a more casual environment. The event will take place on Tuesday, August 7, 2018 from 6:00 pm until 8:00 pm at The District, located at 2437 Park Ave., in the parking lot near The District valet (flyer attached). There will be entertainment, demonstrations, police and fire vehicles, community resource organizations, free food samples, a kid’s area with a bounce house, face painting, and games. National Night Out is a free family event and we hope to see you there!